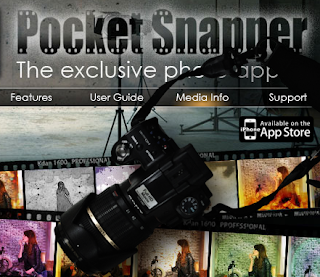 Developer Quote: "Pocket Snapper enables you to take photos from the embedded short video clips of glamorous models, just like what a professional photographer would do!" Have you ever seen photo shoots of a glamorous model in magazines? The pics are each unique with different scenery and perspectives, tilted this way and that, shot in rapid succession by a professional photographer. Photo Snapper by Kdan Mobile (a detail-oriented developer) is a pretty amazing photgraphy tool that simulates this experience. This one of a kind app comes with 2 built-in videos (of models Radka, Felipe T.) from which you can then extract the images you want as though you were actually at a photo shoot. A video of Niko, the 3rd model, is available when you earn 3,000 points. First of all, there is an excellent User Guide with video clips to demonstrate each set of instructions. Pocket Snapper has two modes. One of these allows you to photograph subjects as you usually would, and then add in photo effects afterwards to spice up your pics. 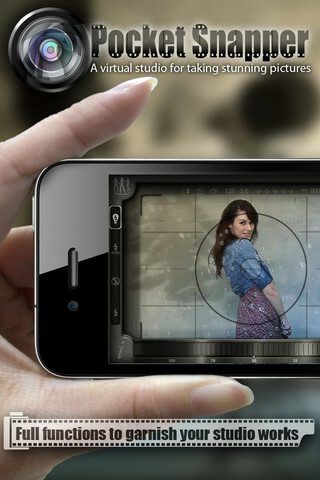 The other mode is iModel where you can become a fashion photographer like you've seen on TV. In this mode, you will enjoy 2 unique videos of models during a photo shoot. While watching each video (and using the iPhone's gyroscope), tilt your device this way and that just like a professional photographer to snap pics of this simulated photo shoot. Make use of the zoom and brightness wheels to get your shots just right. (My only wish here would be to correct the interface which flips upside down between shooting and saving pics). The effect of capturing a real fashion shoot though is uncannily lifelike and a whole lot of fun. If you don't like the snaps you've accumulated, don't worry about it! You can Rotate and Crop to suit your needs. The icing on the cake though is when you add special effects lending an authentic appearance to your photos in Edit mode. Choose Frames to select one appropriate for your photo. Adjust the intensity, add or delete frames until you have the appearance you desire. Once your images are looking awesome, go ahead and set up a cool collage. 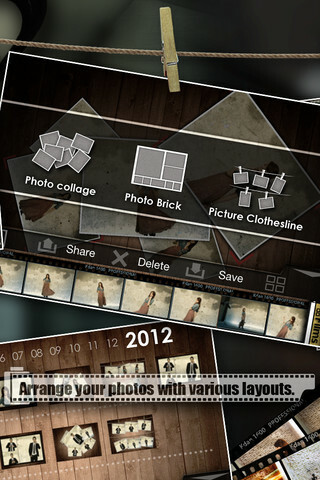 In Photo Management mode, you can choose specific photos then tap the layout button to begin your collage. Select your preferred style and adjust photos (rotate and resize) as you please. Feel free to trash photos that don't fit, or to use the Style button to select from different collage styles. Now you're ready to Share your creations via Facebook, Twitter, Flickr, and YouTube. There's even more features within this app such as a Pocket Snapper community for folks to share and enjoy each unique creation. You may soon even be able to upload your own videos for others to edit much like you have done. Pocket Snapper is perfect for professional and amateur photographers with its attention to detail, yet provides loads of enjoyment which keeps your finger snapping pictures! COOL CONCLUSION: Live the exciting life of a professional photographer churning out creatively captured pics of a simulated photo shoot using the unique Pocket Snapper photo and video app! --Facebook: Kdan Mobile Software Ltd.
--SPECIAL NOTE: Join Pocket Snapper’s member community-earn points to unlock the secret model! Additional photo filters available for purchase. More videos coming soon!